Review by Rich Cline One of the all-time greats is back on the big screen where it belongs--with seven minutes of lost footage restored. 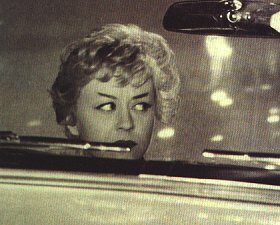 Fellini's masterpiece Le Notti di Cabiria is an energetic, deeply moving examination of the need for love and acceptance. And it features quite possibly the greatest performance ever from the greatest actor ever: Giulietta Masina. She stars as Cabiria, a prostitute in Rome who doesn't let the realities of life interfere with her optimism. From the startling opening scene, she moves through society night by night knowing that eventually she will find what she needs to improve her life. She moves from a glamorous actor (Nazzari) to a lonely charity worker, from religious fervour to hypnosis and magic, from the kind monk who talks about the grace of God to her loyal best friend Wanda (Marzi) ... and eventually to the handsome Oscar (Perier), who sweeps her off her feet. Cabiria is always looking for the silver lining--and when everything seems to be going right, she can hardly believe her luck. The film works on so many levels that it quickly gets under our skin and stays there. Fellini is on top form; vivid "colours" dance across each black and white frame with a quirky energy that cuts through to the earthy comedy and tragedy of real life. But this isn't just an art film--its universal themes touch a raw nerve. We vividly feel Cabiria's desire to find meaning in life ... to be loved and respected even if it means risking everything. Astounding and essential. Winner: Best Actress Giulietta Masina (Cannes 57); Best Foreign Film (Oscar 58).